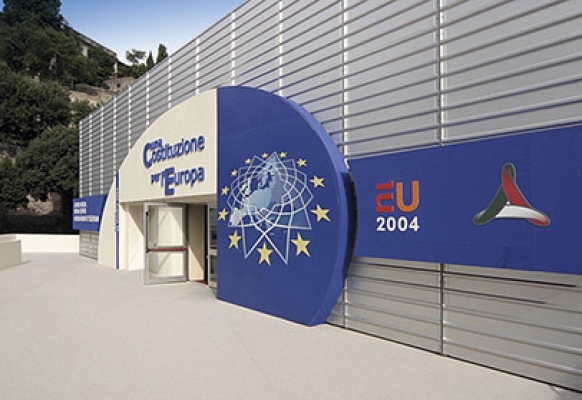 Eurotend marquees are especially designed to host events in large, welcoming areas. Bearing structures are made from anodized aluminium, the ideal choice for durableness. Anchoring is always performed according to the features of the underlying ground by means of steel nails, ballasts or chemical anchors. Structural stability is ensured even further by a steel bracing system. Marquee roof and sidewall are constituted by a special mould- and dirt-resistant Class 2 fireproof PVC tarpaulin. Coatings in white PVC or, on demand, in coloured, opaque or transparent PVC depending on customers’ requirements are always in perfect state thanks to particular washing processes performed before each new installation. We provide moreover waterproof PVC tarpaulin, white and coloured PVC coatings. Thanks to the use of modular structures, Eurotend marquees can be adjusted to several needs – from small to large dimensions. Marquees are especially suitable to special events such as fairs, exhibitions, sport events, meetings, fashion shows, parties and ceremonies.